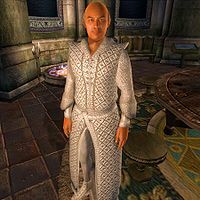 Irlav Jarol, an Imperial mage, is a Master-Wizard of the Mages Guild who is part of the Council of Mages and works as a researcher for the Arcane University, specializing in Ayleid history. He is also the author of Magic from the Sky. Like many of his fellow University dwellers, he lives a very laid-back existence and never seems to overexert himself. He sleeps for six hours from 6pm until midnight, then heads for the Council Chambers, where he stays until 4pm. He then heads out into the university grounds to take a relaxing walk around the alchemy garden until it's time for bed once more. There are two changes to his schedule: the first is during the Vahtacen's Secret quest, when he will be found from 10am until 4pm in the Arch-Mage's Lobby waiting for you. The second is during the Light the Dragonfires quest, when he and all other Imperial City residents are confined indoors. At the beginning of The Bloodworm Helm quest he will be removed from the University and his dead body will appear in Fort Teleman. He wears upper-class attire consisting of the rare white mage's robes and white mage's shoes (although following his death, he is found wearing gold trimmed shoes). He also carries a sizable amount of gold. 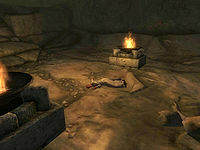 Until his death, he carries the Ayleid Reference Text involved in the Vahtacen's Secret quest. He doesn't wield any weapons, relying instead on a set of leveled spells from all of the magical schools. During The Bloodworm Helm quest he will be carrying the unique artifact of the same name. The first time you speak to him, as long as Vahtacen's Secret has not begun, he will introduce himself, "Excuse me. I'm Irlav Jarol, a researcher for Arcane University. Ayleids are my specialty." When asked about the city, he will reveal his interest for the Ayleid civilization: "You know, of course, the Imperial Palace is Ayleid. White Gold Tower, they called it, back in the Middle Merethic, when the Aldmeri ruled Tamriel." Once you have received the Vahtacen's secret quest he will greet you in relation to it: "Here about Vahtacen, are you? It's a damn shame. I haven't been giving the project the attention it deserves. The last report I received from Skaleel indicated there was some sort of problem. A blocked passage, or something, that they couldn't get past. I'd investigate it further, but I'm needed here with the Council. Raminus says you've got a good head on your shoulders. Look into it for me, will you? You can find Skaleel at the site. Access is restricted, so you'll need this key." He will proceed to mark Vahtacen on your map and give you a copy of the key needed to access it. When asked about Skaleel he will point you to her for questions: "She's the mage heading up on-site research. She can tell you more about whatever it is that's impeding their progress." He will describe Vahtacen: "It's an Ayleid ruin, southwest of Cheydinhal. We suspect there are some interesting things inside, so a research project was established. Skaleel is there now, working on investigating the ruins." When you leave he will encourage you to be swift: "I eagerly await your return." Speaking to Irlav again will yield this response: "Get yourself to Vahtacen, and see if you can help Skaleel with whatever is holding up her progress." Walking near him anytime after he has given you the instructions to head to Vahtacen, he will show his eagerness: "Any progress to report?" When you return to Irlav with the Ancient Elven Helm he will be intrigued: "What's this, some sort of Ayleid artifact? Well, well. Raminus was right in sending you out there. Good work. I'll be sure to put in a good word for you." When you have completed Vahtacen's Secret, he will congratulate you on a job well done: "Good work getting that straightened out. I'm glad someone finally came along that was able to make progress with it." Raminus Polus has the following to say about Irlav: "He's a good man, but Council matters have distracted him lately, and he's been neglecting his other work." In the depths of Vahtacen, Skaleel tends to agree: "Irlav sent you, did he? Figures. He can't be bothered to come check on his own project, so he sends someone who knows nothing about it. And this is supposed to help?" After you have found the artifact, she will react with irony: "Get that artifact back to Irlav at the Arcane University. He's in a better position to study it than I am. Or to assign someone else to do it..."
The events that will lead to Irlav's demise will be laid out for you by Hannibal Traven, as part of the Bloodworm Helm: "A group of mages led by Irlav Jarol took the Helm, and have retreated to Fort Teleman, in an effort to study it further. They hope to learn enough from it to find some way to fight Mannimarco. I tried to dissuade them, but it was no use. I would like the Helm returned, so that it may be kept safe here in the University. I fear Irlav has made himself a target for the Necromancers." And he will add: "It was last seen in the possession of Irlav Jarol. He was taking it to Fort Teleman; I can only assume he is still there." When you have found Irlav's lifeless body in the depths of Fort Teleman, a shocked Hannibal Traven will reply: "Irlav is dead? I tried to warn him. I tried to tell him it was a mistake to leave with the Helm. I shall return the Helm to a secure place in the tower. It's the least I can do for Irlav. Thank you." A crystal ball is added to his inventory at the end of the quest Vahtacen's Secret, when you give the Ancient Elven Helm to him. The purpose of this is unknown. The dead version of Irlav Jarol that you find in Fort Teleman is technically a different NPC called "IrlavJarolDead" (RefID 00014675, FormID 00014674). As a result, his inventory after death is slightly different than while he is alive. Also, the Bloodworm Helm is added to his corpse by a script triggered when you activate his corpse; this ensures that his corpse is not wearing the helm. "IrlavJarolDead" is not a member of the IC Citizens, Arcane University, or Nobility factions. This issue has been addressed by version 3.4.0 of the Unofficial Oblivion Patch; his clothing now matches his former living self. Irlav has a second response for the topic of the Imperial City which seems to have meant to be used if he had low disposition towards you. He would have said: "How quaint. You seek to educate yourself. At the expense of my precious time. Go. Shoo. Bother someone else." However, since no disposition condition is imposed on it, the dialogue about White Gold Tower always takes precedence.